Do you like Christmas cake? Who doesn't, right? The reality series Ace of Cakes on the Food Network has made several episodes about their Christmas cakes. This TV show about Charm City Cakes, the bakery run by Chef Duff Goldman in Baltimore, Maryland, shows the behind-the-scenes preparations, baking and decorating of cakes for all kinds of celebrations. The first yuletide episode came in the third season entitled 'Charm City Cakes' in which the bakery makes a specialty cake for Radio City Music Hall’s 75th annual Christmas Spectacular with the Rockettes. This 2007 episode is available to watch on DVD. There is also 2009's 'Demolition Cake' where Mary makes a finely detailed Christmas Stocking cake for a woman known for making cross-stitched stockings for her family. Season 8 brought the episode 'Christmas in July' in which Chef Duff makes a plated dessert for a public relations firm's Christmas in July party. And last December brought a special one hour-long episode, 'Holiday on Icing.' This 2010 special sees the staff busy decorating a Christmas tree cake for Andrews Air Force Base’s golf course holiday party. And, Katherine accidentally breaks a fragile glass topper for a holiday wedding snowflake cake. Duff organizes the bakery's first ever Secret Santa gift exchange for the staff. It's also fun to follow the employees of the bakery to see what they are up to each week. Mary Alice and Elena are my favorite staff members at Charm City. But Geof is hilarious too. I have been lucky enough to enjoy a cake made by Charm City Cakes. 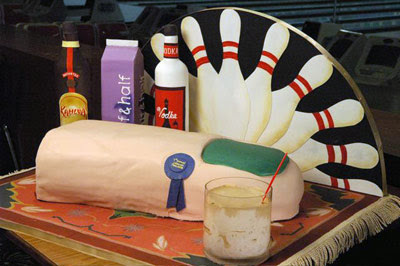 I was at the Lebowski-fest in Louisville, Kentucky in 2008 when the bakery made a White Russian-flavored cake inspired by the Coen Brothers 1998 movie The Big Lebowski. Walter AND Chef Duff can get you a toe! I got a piece of this cake and it was delicious! Though I've never been able to find myself in the crowds of people, I was there when they filmed for the episode entitled 'The Big Cakeowski' from the fifth season. I got to see Duff Goldman's band perform on the outdoor stage. And, yes, I entered the costume contest dressed as an In-N-Out Burger drive thru employee. I'm looking forward to the Christmas in July celebration here on the blog. Summer is going fast as it begins next week! Be sure to stop back during the entire month to catch all the blog posts covering our favorite holiday entertainments made during the 1990s. What's your fav 1990s Christmas movie? special? episode?